Food stocks, including restaurants and grocery stores, have been getting hammered largely due to a drop in commodity prices. The first couple of weeks of September have been rough for supermarkets. Here's how four of the biggest pure-play grocery stocks have done so far. 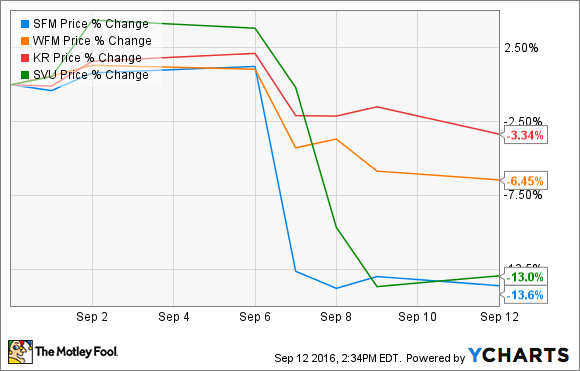 Down an average of 9% through Sept. 12, these stocks have fallen on concerns about food deflation, after both Sprouts Farmers Market (NASDAQ:SFM) and Supervalu (NYSE:SVU) issued warnings last week and lowered their full-year guidance. On Wednesday, Sprouts noted "a prolonged deflationary environment, competitive landscape, and industry dynamics" as it sharply cut its full-year predictions for comparable sales and EPS. The company now expects EPS in the $0.83 to $0.86 range, down from a prior flat-growth forecast of $0.96 to $0.98. Supervalu echoed its organic food peer the next day, citing "deeper levels of deflation" when it lowered its adjusted EBITDA forecast by 5%. Then on Friday, Kroger (NYSE:KR), which has been the closest thing to a bulletproof stock in the industry, posted its slowest comparable-store sales growth in six years at 1.7%, which it attributed in part to 1.5% food deflation. As a result of deflation, Kroger lowered its full-year EPS forecast to a $2.10 to $2.20 range from $2.19 to $2.28. Lower prices at the grocery store are good news for consumers, but the fall in commodity food prices has forced the supermarket industry to engage in heavy promotions, cutting into its already narrow profit margin. Prices on eggs, dairy, and beef in particular have fallen sharply; egg prices are expected to be down 14% to 15% this year after spiking last year due an avian flu outbreak, and beef prices should be down 3% to 4% after several years of inflation. Restaurants compete with supermarkets for consumers' food budgets, so one might expect that what's good for one industry would be bad for the other -- but that's not the case with food deflation. Lower commodity prices allow restaurants to save on expenses, but they also result in lost business to grocery stores, where consumers can take advantage of those lower prices. The trend has led analysts to call for a "restaurant recession," and many fast-food chains posted suddenly slowing comparable-sales growth in the last quarter. While there are several theories for what's behind slowing sales growth at restaurants -- including overexpansion and early warnings of a broader economic slowdown -- executives at chains including McDonald's (NYSE:MCD), Wendy's, and Jack in the Box have also cited food deflation as a cause of slowing sales growth. McDonald's, which has more than 14,000 domestic locations, saw comparable-store sales growth in the U.S. decelerate all the way from 5.4% in the first quarter to 1.8% in the second, which management attributed to "softening industry growth." A version of that trend played out across much of the industry: Nation's Restaurant News reported a 1.7% decline in comparable sales in the quarter. Pizza was the only segment that grew, as delivery concepts like Domino's and Papa John's continued to post strong growth, a sign that delivery may be immune from the macroeconomic environment. For long-term investors, the best strategy may just be to sit tight. Commodity food costs are notoriously difficult to forecast as they can be affected by factors like weather and disease in addition to the normal vicissitudes of supply and demand, and there's evidence that the market has already priced in the deflationary environment, following last week's announcements by Supervalu and Sprouts. At Kroger, shares actually rose modestly after its Friday morning earnings report even though it lowered its guidance for the year. The picture for restaurants looks less clear. General economic data on job growth and retail sales remain solid, indicating that the nation is not slipping into a recession, and slower sales growth nearly across the board at restaurants suggests that lower prices at the grocery store are a likely culprit. While sales growth may be slower, the good news here is that restaurants are saving on food costs, helping to boost their bottom lines. Negative headlines may prevail in the coming months, but stocks with momentum like Kroger and McDonald's should continue to outperform their industries despite those headwinds.